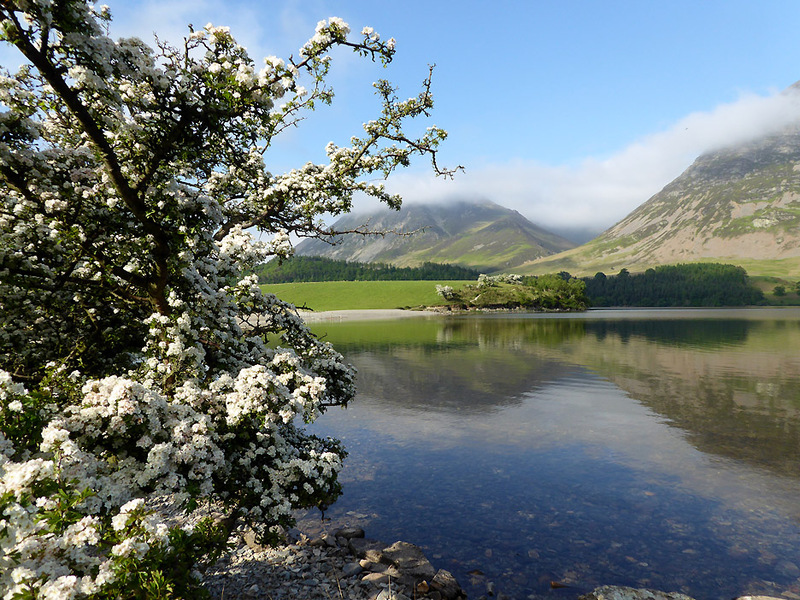 " Hawthorns and Cotton Grass - with Jo and Allan "
Date & start time: Wednesday 24th May 2017, 3.30 pm start. 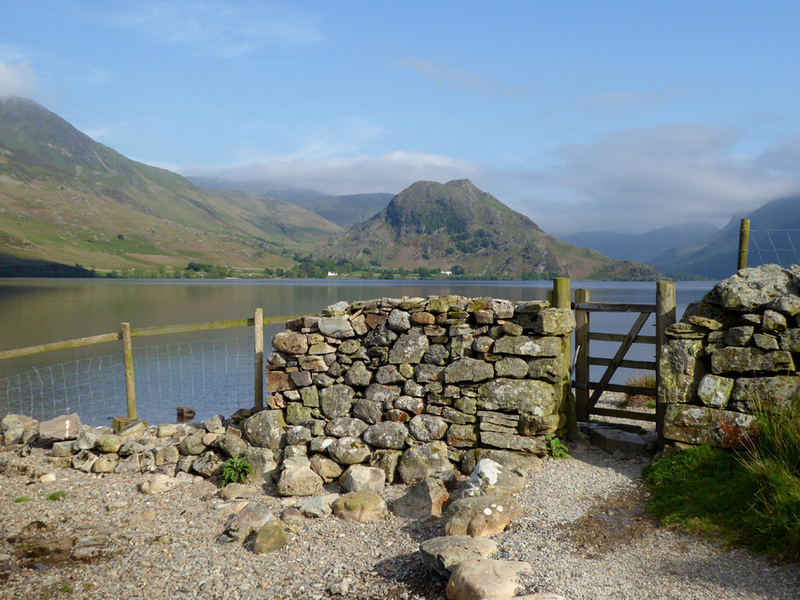 Location of Start : The red phone box, Loweswater , Cumbria, Uk ( NY 143 211 ). 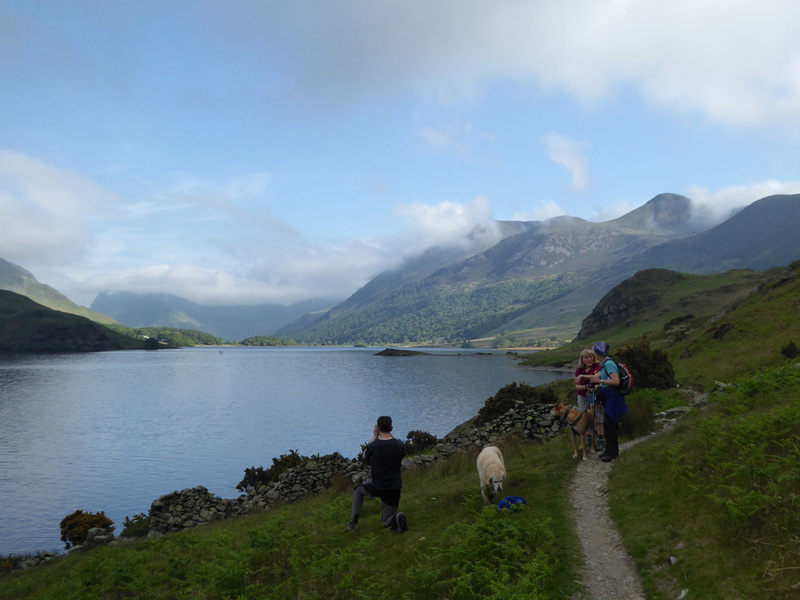 Places visited : Low Park, Crummock Water, Low Ling Crag and return via the beach. 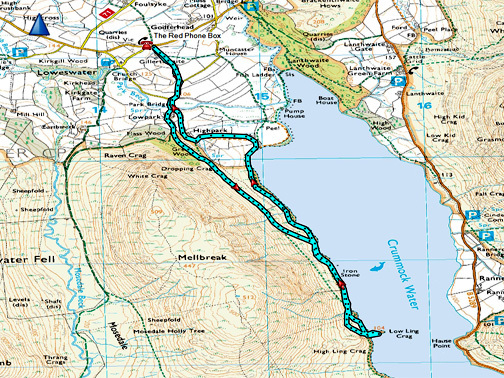 Walk details : 4.5 miles, 400 ft of ascent, 3 hours 10 mins. Highest point : The high ground above High Park, on the way to the lake (485ft - 150m). 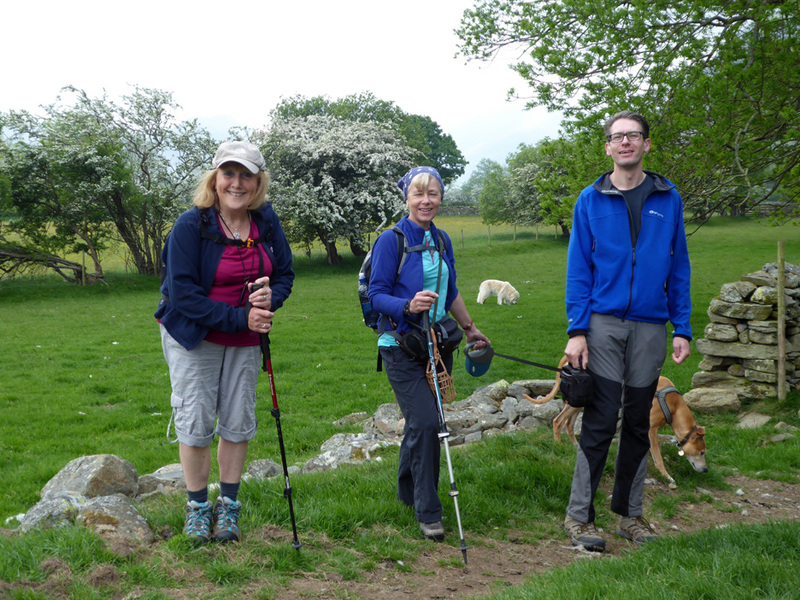 Walked with : Jo, Alan Kilduff, Ann and our dogs, Amber, Harry and Dylan. Weather : A little iffy to start but clearing to a beautiful afternoon. Gentle, warm breeze. so it made sense to them to come over on the same day and we found a local walk for the afternoon. The weather this week has been really good . . . but unfortunately a mist was rolling in, just as we started our walk ! Our first extended walk on our return was decided by committee . 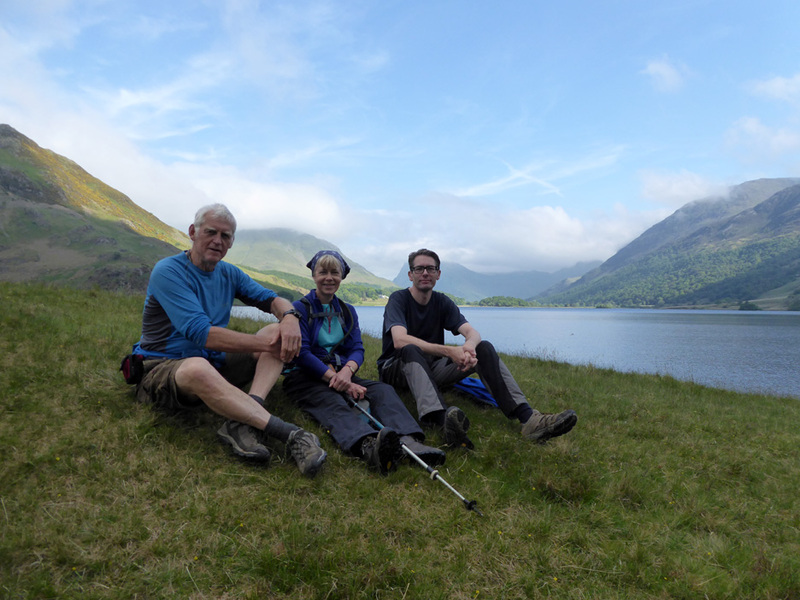 . . Jo, Alan and ourselves.
. . . and ended up with a walk to Low Ling Crag to see the lake and the hawthorns. 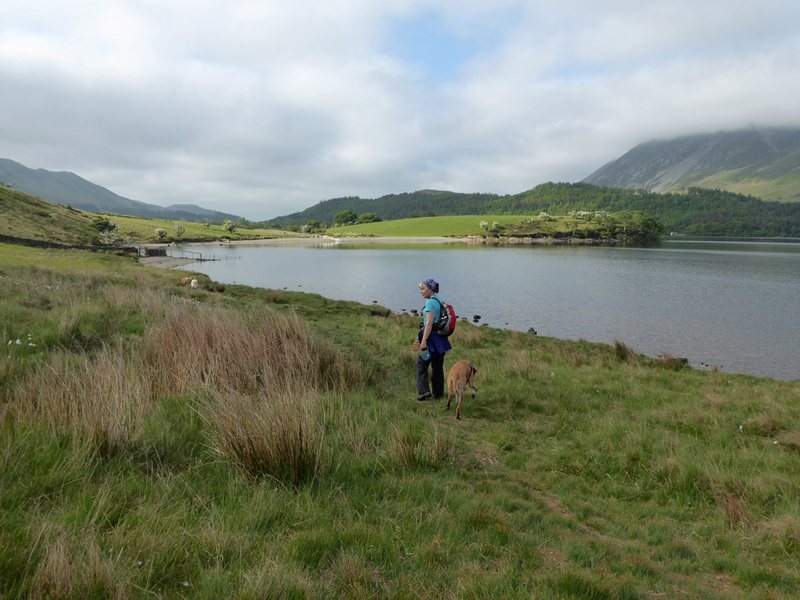 After walking past Low and High Park under Mellbreak's northern crags we joined the lakeshore path alongside Crummock Water. The mist in the first photo has mysteriously disappeared . 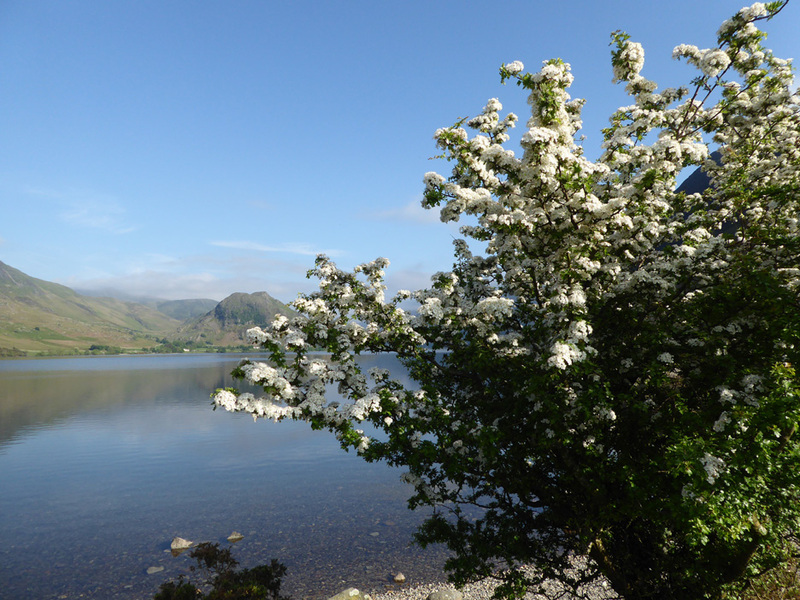 . . it had risen, forming light cloud across the high fells. 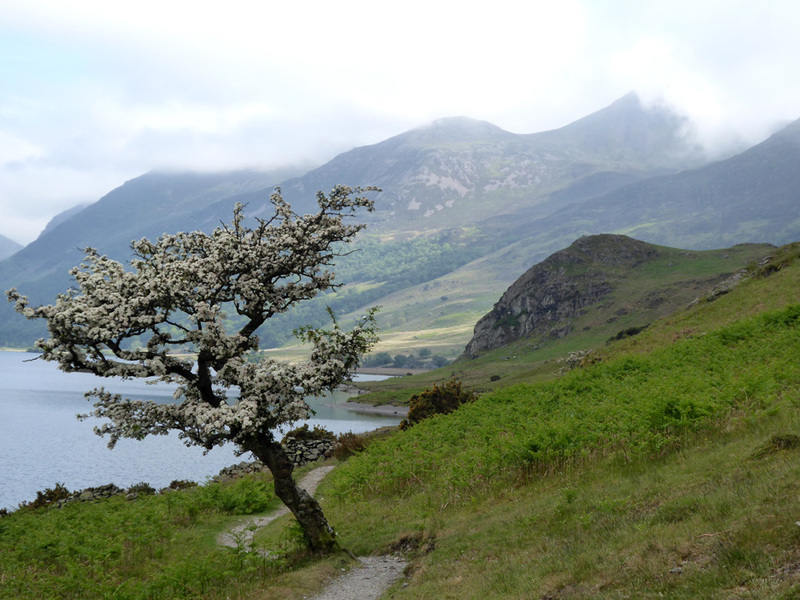 Ahead, above the first little headland, is the Iron Stone with High and Low Ling Crags beyond but in shadow. Alan, Jo and Ann . 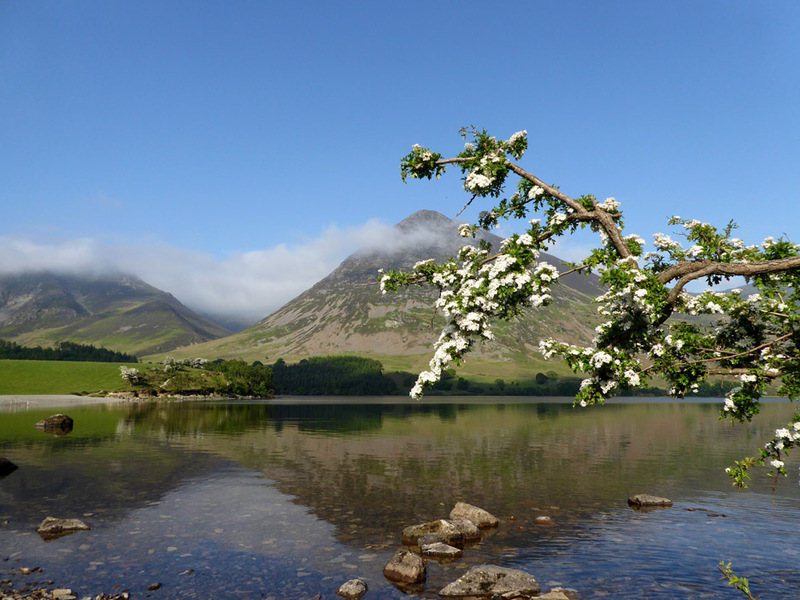 . . the "mighty fell" opposite is Rannerdale Knotts. 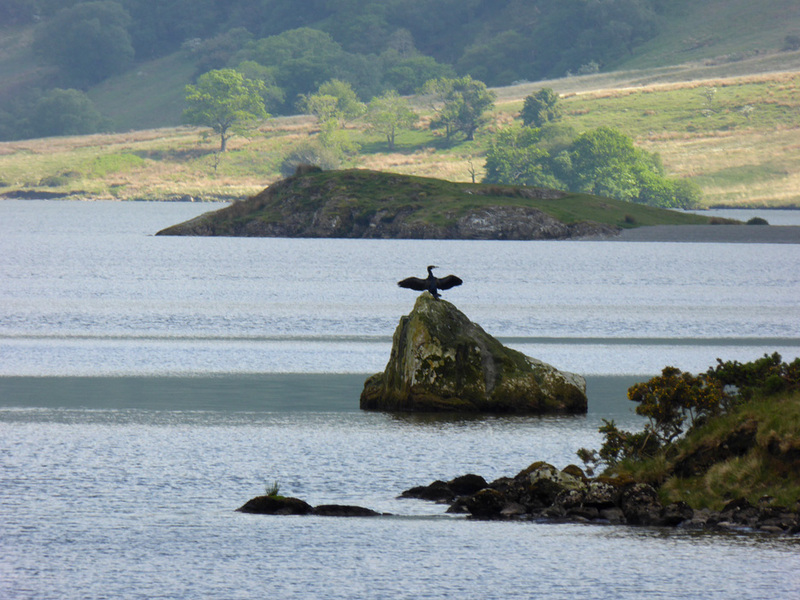 Ahead we spotted a cormorant wings outstretched on the Iron Stone. He was drying his feathers in the warm afternoon breeze. He flew off as we drew nearer but it was a lovely sighting. 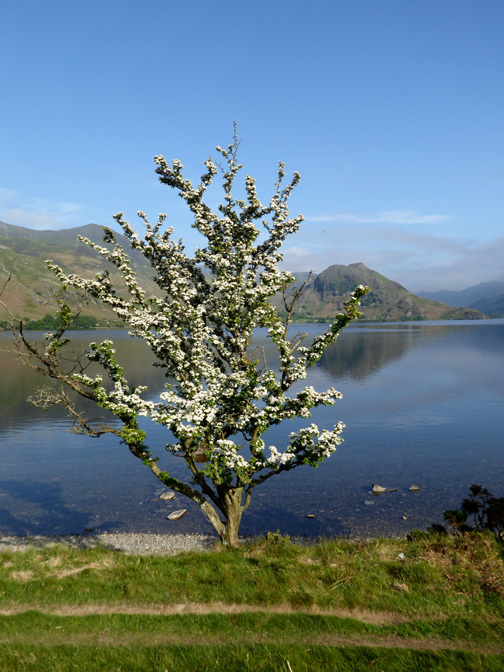 The hawthorn trees are in full bloom this month . . . they are appropriately known as May blossom of course. 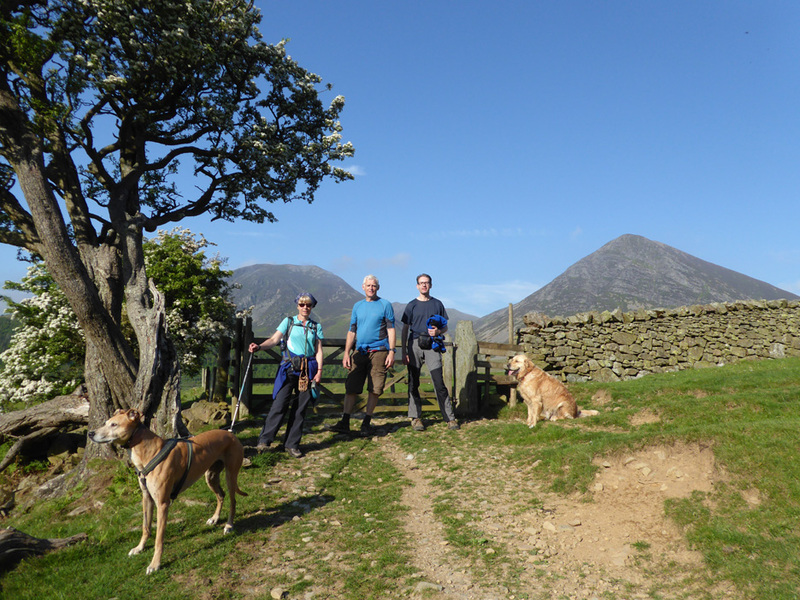 Three of us on Low Ling Crag . . . the photo taken by the fourth member of the group, Ann of course. 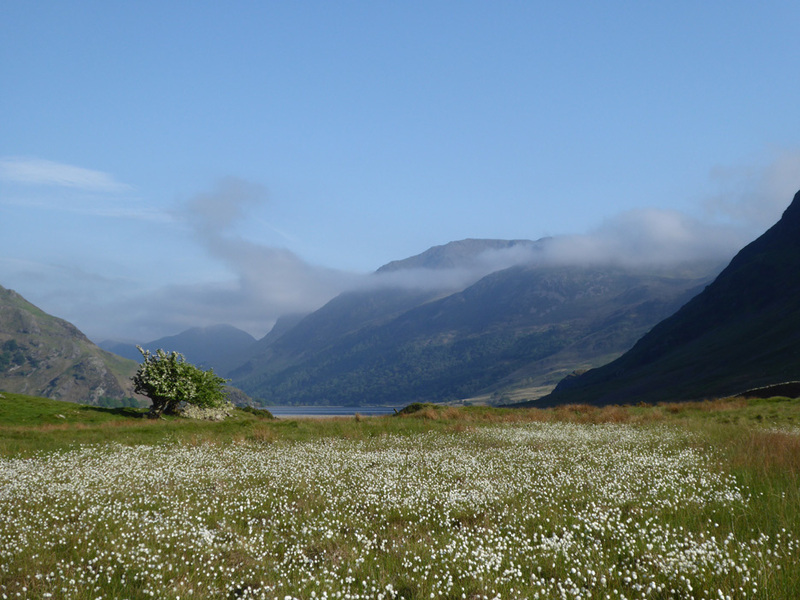 Even though the mist had cleared, above us there was sufficient cloud to cast a shadow over the grassy bank of the 'island'. 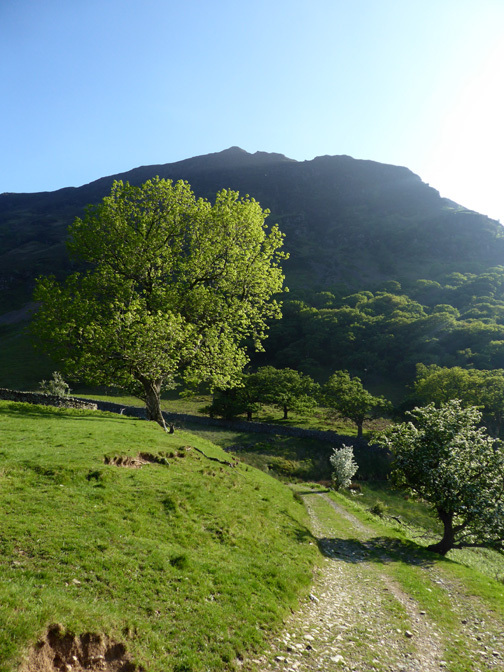 so here's a sunny one looking up towards Red Pike and High Stile as we return along the lakeside path. 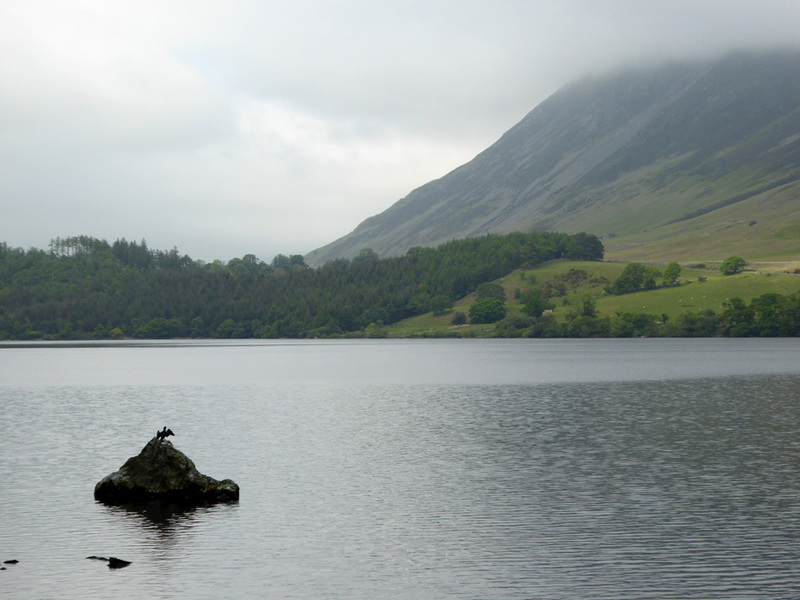 The cormorant that had flown off across the lake had returned to his perch on the Iron Stone once again. We would disturb him a second time in the day as the path passes close to the shore at this point. On the return route we chose to stay on the lower path and headed towards the beach at The Peel. This lower path was still very damp despite the extended dry weather we've enjoyed this spring. However, the dampness here has allowed the cotton grass to give a fine display of its characteristic fluffy seed heads. Through the gate to the beach . . . The weather has dramatically improved over the last hour and it is now a fabulous afternoon. A wider view of the rather picturesque gate and repaired fence. but it will also help him by removing the brown, peaty mud from his legs . . . a bonus for us too. Far too nice to rush . . . here Alan captures the scene, possibly for his web site. Perfect summer views . 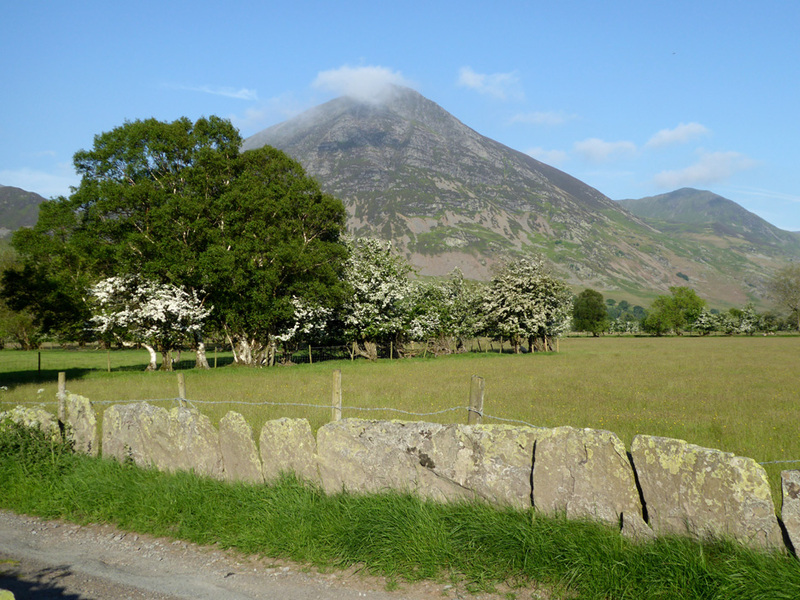 . .
with the mist behind now just covering the tops of Whiteside and Grasmoor. A study in green, white and blue. The tree by the beach . . . with Rannerdale Knotts away in the background now. 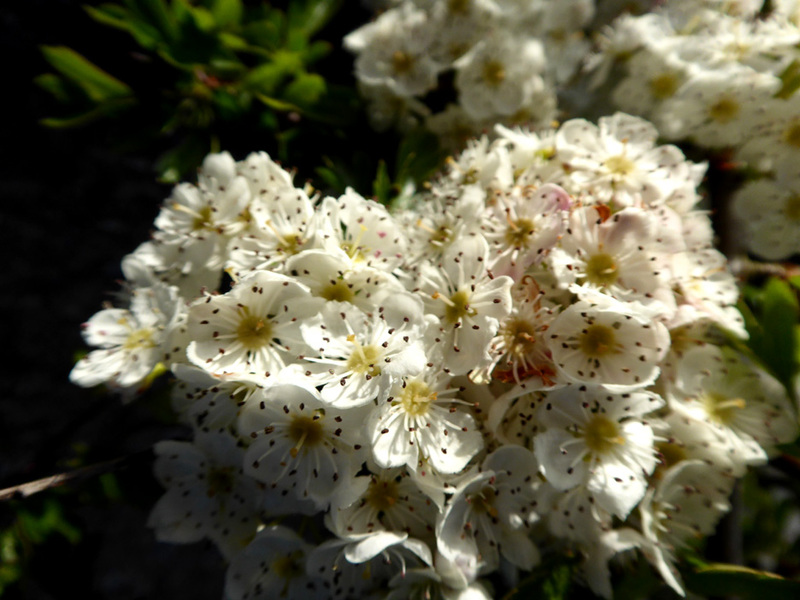 The glorious detail of the hawthorn flowers. and hang loosely around our waists. as we take the path back up towards High Park. 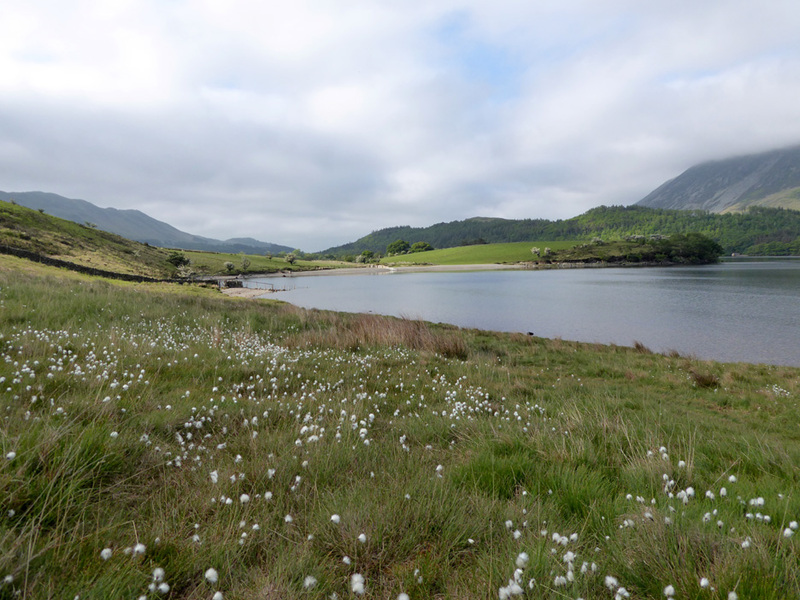 On the low ground alongside the headland of The Peel the dampness has encouraged the cotton grass once more. 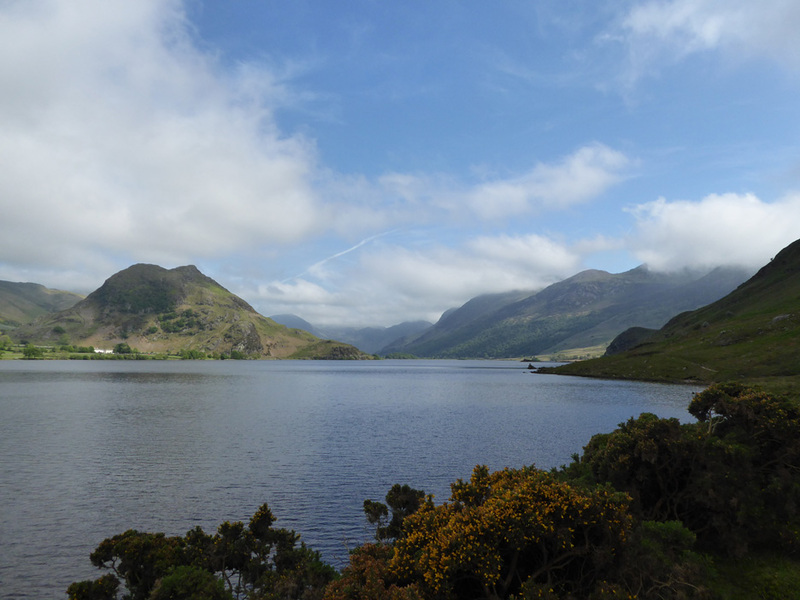 Blues and purples were the colour of the Rannerdale walk . . . blue, green and creamy white were the colours of the one today. Bright sunshine and clear summits as we near High Park. Ann halts us once again for a group photo. how the cloud has evaporated from the high fells. 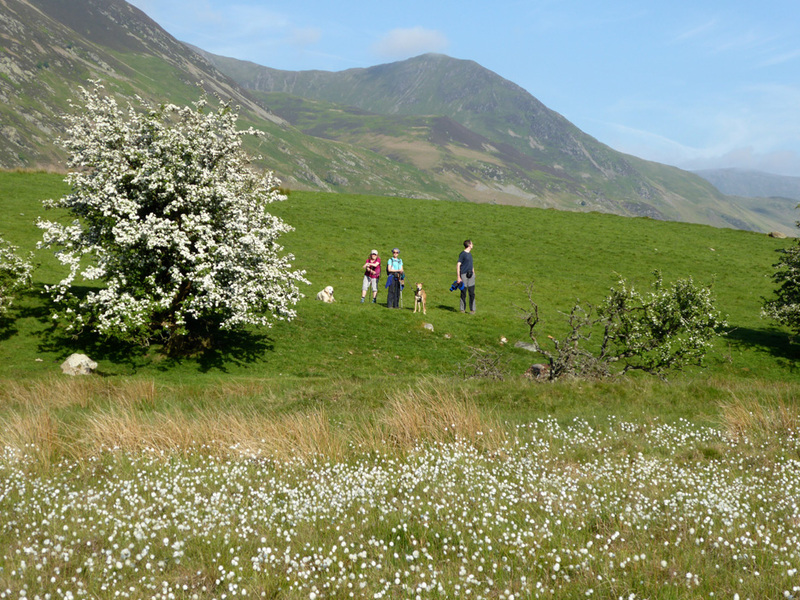 Back across the meadows and fields directly towards Gillerthwaite and our cottage. On the way we pass this unusual wall made of large slate slabs, as opposed to the more normal style built of small dry stonework. and were staying on for supper this evening. 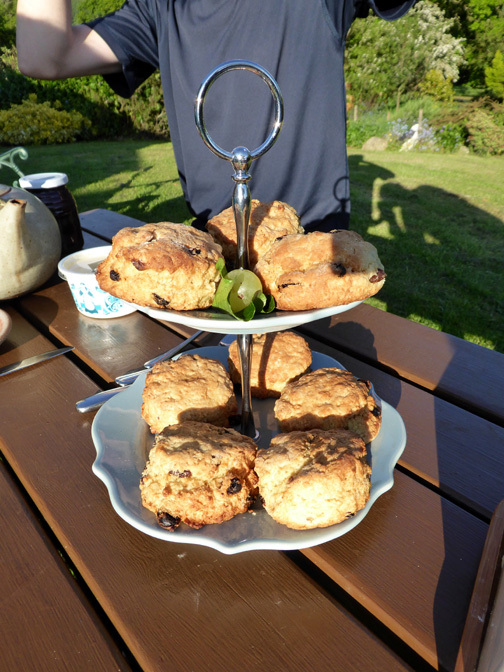 to fit in a rather nice home-made Loweswater cream tea. Ann had even bought some clotted cream in honour of the occasion. 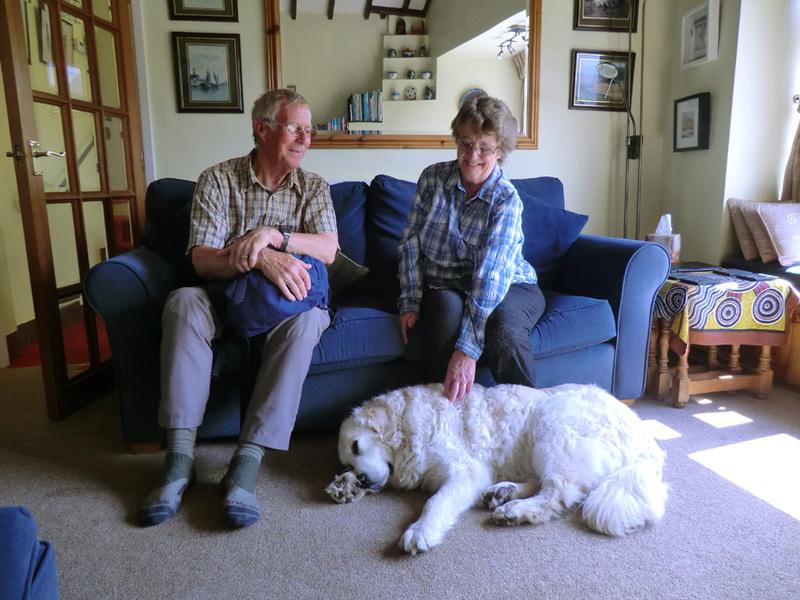 We also enjoyed a visit from Chris and Linda Howarth who were up in the Lakes. 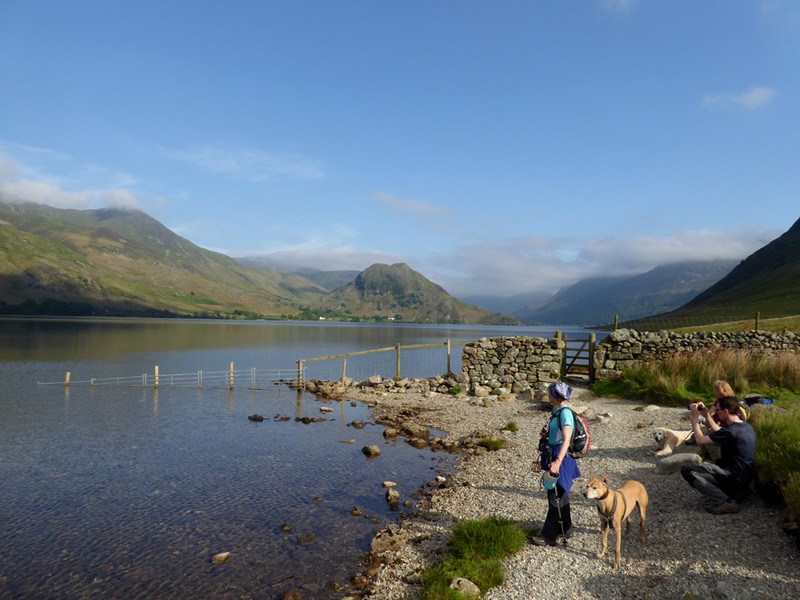 They really wanted to meet Harry and Dylan who feature such a lot on the website and in their Loweswatercam Calendar. Harry . . . the perfect older gentleman . . . ready to greet and then prepared to relax. Hi . . . my name's Dylan . . . Have you come to play ? 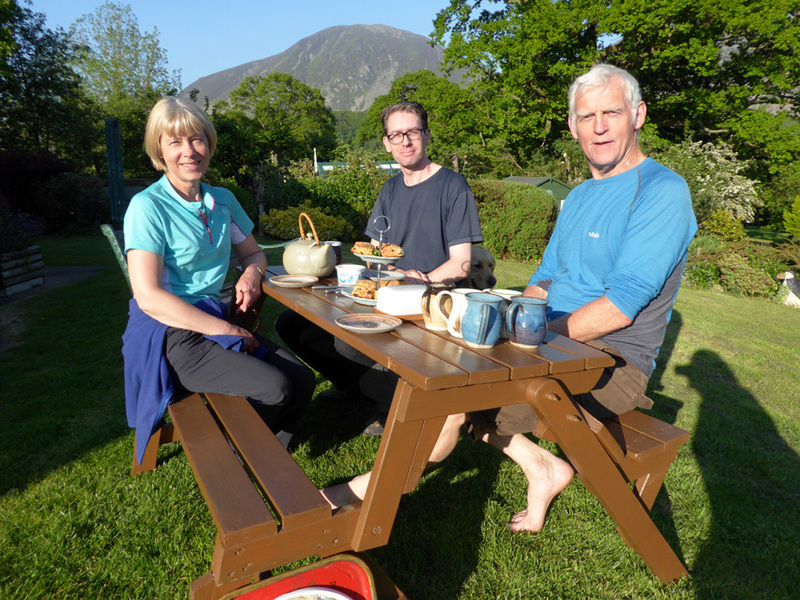 Fortunately Chris and Linda did manage to escape and by the sound of it had a lovely week in the lakes. 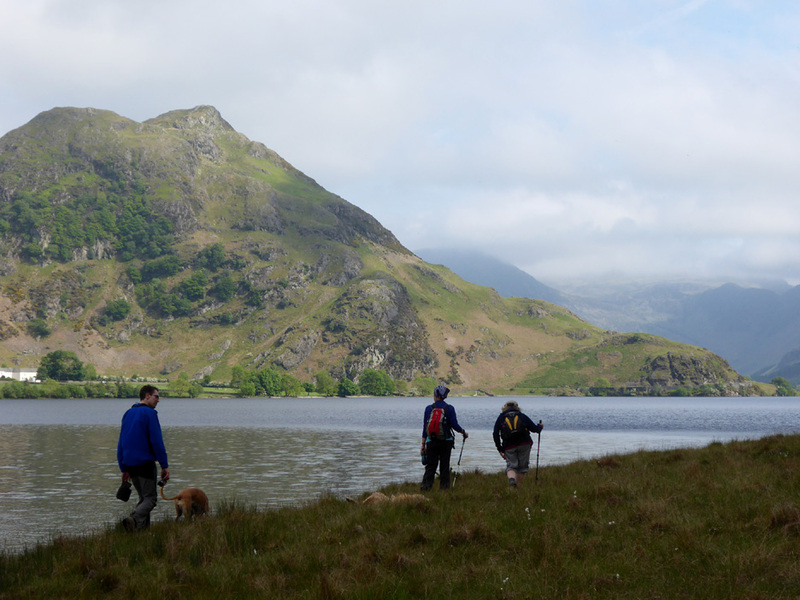 This was taken at Cow Bridge (Glenridding) last Tuesday just before they commenced their walk. 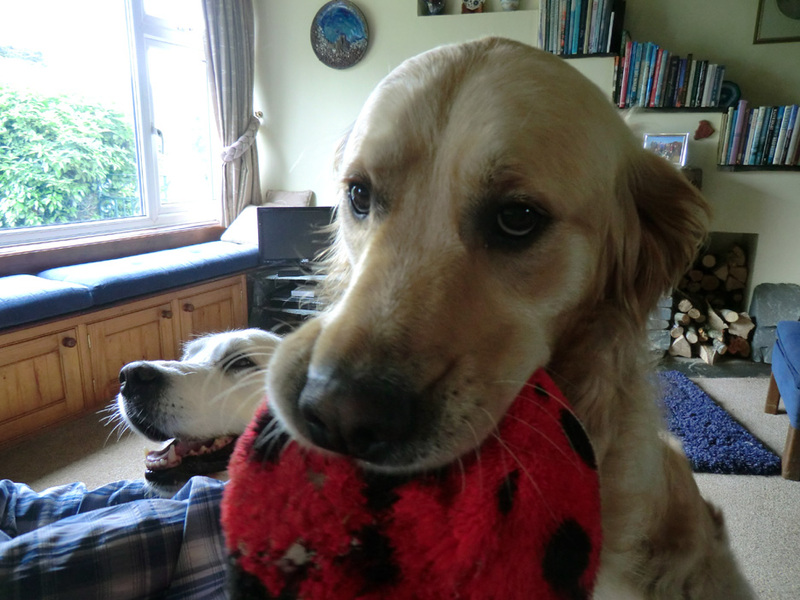 We did enjoy meeting you and the dogs and I've sent some photos, I hope they are okay. and I added another 13 'Wainwrights' to my list so now have just 39 to complete. Thanks to you both for calling round . . . it is always nice to meet people who've enjoyed the website. Technical note: Pictures taken with either Ann's Panasonic Lumix TZ60, and one on my phone camera. This site best viewed with . . . one of those plates for cakes that they use in posh places !